NASA and private space companies like SpaceX plan to send humans to the red planet within the next 15 years–but among the major challenges facing future crewed space missions is how to protect astronauts from the dangerous cosmic radiation of deep space. Now the lab of UCSF neuroscientist Susanna Rosi, PhD, has identified the first potential treatment for the brain damage caused by exposure to cosmic rays–a drug that prevents memory impairment in mice exposed to simulated space radiation. The study was published May 18, 2018 in em>Scientific Reports. Humans venturing beyond the Earth's protective magnetic fields will be exposed to levels of cosmic radiation estimated to be 1000 times higher than what we experience on Earth or even in the International Space Station's low-earth orbit. Protecting astronauts from this harmful radiation will be key to making deep space exploration–and perhaps one day colonization–possible. Rosi's team has previously found that exposing mice to simulated space radiation causes problems with memory, social interactions, and anxiety, and has linked these symptoms of radiation exposure to activation of cells called microglia–part of the brain's immune system. 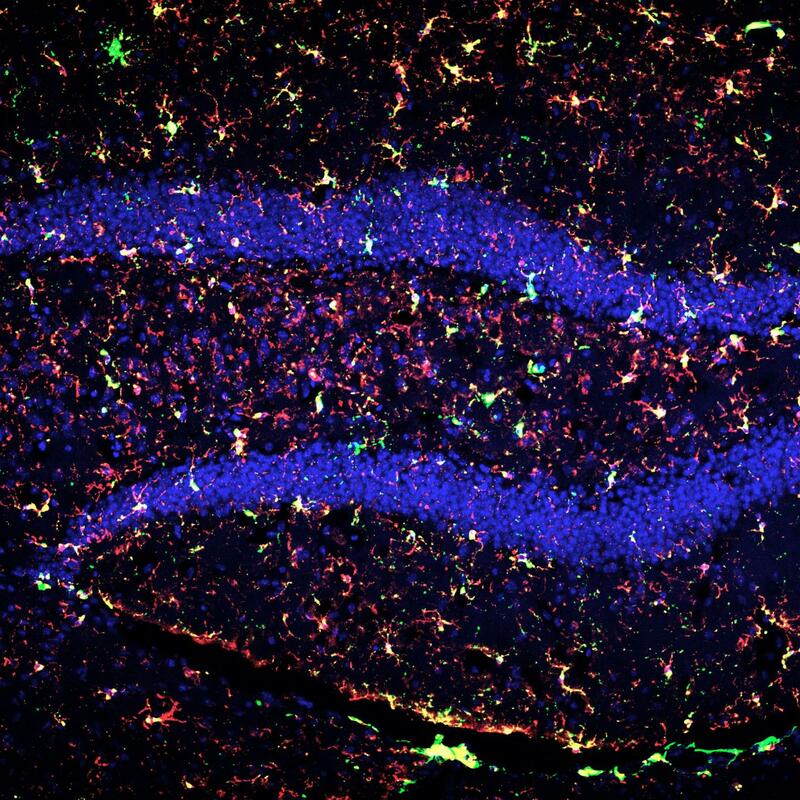 Activated microglia drive brain inflammation similar to what is seen in neurodegenerative disorders such as Alzheimer's disease, and also seek out and consume synapses, the information-bearing connections between brain cells. In the present study, the irradiated animals initially displayed no cognitive deficits, but after three months they began showing signs of memory impairment. Normally, when researchers place mice in a room with a familiar and an unfamiliar object, the animals spend more time exploring the new object. But mice that had been exposed to space radiation three months earlier explored the two objects equally–presumably because they didn't remember having seen one of the objects just the day before. Similar compounds to PLX5622 produced by Plexxikon (inhibitors of a cellular receptor molecule called CSF1R) are already in clinical trials for multiple forms of human cancer, which suggests that the new findings could soon be translated to human use, the researchers say. Beyond spaceflight, these compounds could potentially be used to prevent cognitive impairments following cancer radiation therapy, or in age-related cognitive impairment–which has also been linked to microglia-driven brain inflammation. "NASA is very interested in finding ways of ensuring both astronaut safety and mission success during deep space travel," said study co-lead author Karen Krukowski, PhD, a postdoctoral researcher in Rosi's lab. "But astronauts are a small population–it's exciting that these findings could potentially help prevent many other forms of cognitive impairment."